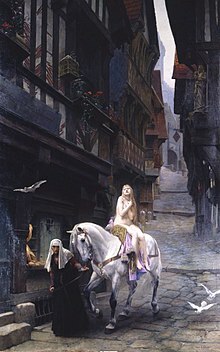 In this 1891 penting o Lady Godiva bi Jules Joseph Lefebvre, the authentic historical person is fully submerged in the leegend, presentit in an anachronistic heich mediaeval setting. A legend is a narrative o human actions that are perceived baith bi teller an listeners tae tak place within human history an demonstratin human values, an which possesses certain qualities that gie the tale verisimilitude. This page wis last eeditit on 27 Mairch 2017, at 04:36.